Internal pages restricted to lab member use only. 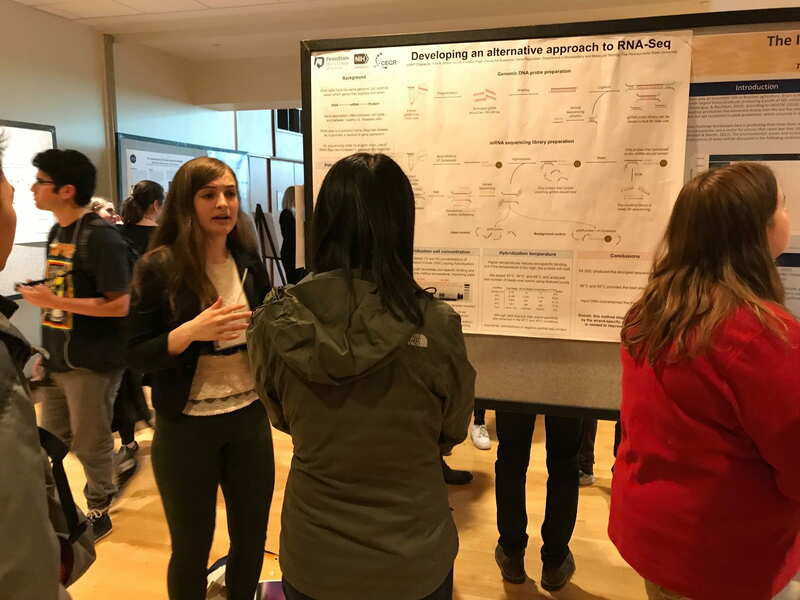 April 17, 2019 – Pugh Lab Undergraduate Researchers, Julia Cipparulo, Matthew Driban, and Jordan John, participated in the 2019 Penn State Undergraduate Research Exhibition. Sequencing messenger RNA provides a readout of gene expression, which is misregulated in many diseases. However, standard RNA-Seq protocols have many steps that require trained hands to perform. We are attempting to develop a simplified approach to study gene expression that uses a provided probe library and an overnight hybridization step with isolated mRNA. By streamlining sample preparation, we hope this method will be an easier, cost-effective alternative to RNA-Seq. 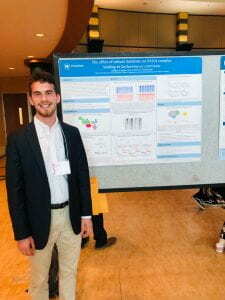 Matthew Driban presented his research on THE EFFECT OF SUBUNIT DELETIONS ON SAGA COMPLEX BINDING IN SACHAROMYCES CEREVISIAE. The SAGA complex is a multi-functional protein complex involved in transcriptional regulation and histone modification, particularly under stress. Notably the SAGA complex has been linked to development of certain neurodegenerative diseases and cancers. To better characterize SAGA’s ability to regulate gene expression under various stressors, I analyzed SAGA’s binding characteristics under two conditions: subunit knockouts and heat shock. These analyses resulted in a clearer picture of SAGA’s regulatory role under different conditions of stress. 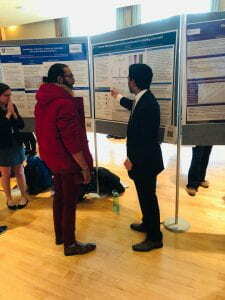 Jordan presented his research on Intrinsic DNA Shape features drive preferential Fis binding at its motif. Abstract: Fis, factor for inversion stimulation, is a nucleoid-associated protein in E. coli. Here we study the binding of this protein throughout the genome. The binding of Fis is determined in part by the sequence motif, but the shape of the DNA also correlates with its binding. High occupancy Fis sites have different shape features when compared to low occupancy Fis sites despite the similar motif sequence suggesting that shape helps determine Fis binding. Please click on either title above or pictures below to read the abstract about their research. Pugh Lab welcomed a brand new Lab Manager, Daniela James, Ph.d. We are excited to have Daniela working in the lab and helping to make it better everyday! Dr. Will Lai gave a talk on Methods of defining “success” in ChIP-seq/exo experiments on Saturday December 9, 2018 at the The Conference on Regulatory and Systems Genomics with DREAM Challenges 2018. The conference was held at NYU Langone Health, in New York City, New York. Dr. Pugh has now been appointed as the Director of the EGR Training Grant! 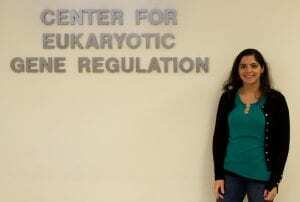 This NIH-sponsored Training Program prepares young scientists to excel in both experimental and computational approaches to address fundamental questions in gene regulation. Nearly all aspects of biology and human disease are rooted in gene regulation. 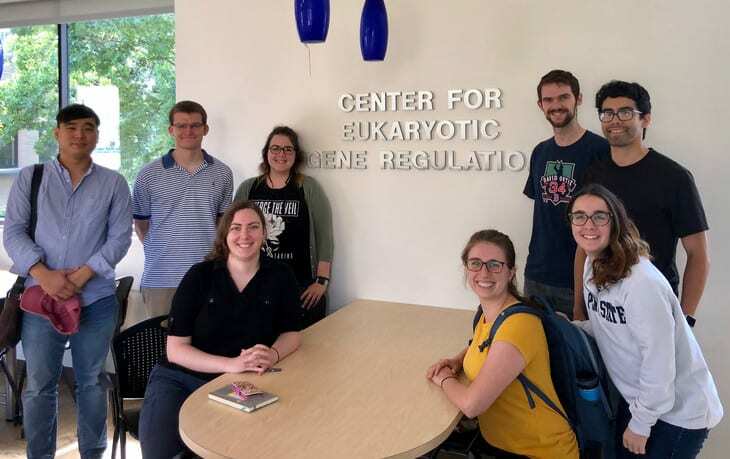 Students in the program are vital members of the Center for Eukaryotic Gene Regulation (CEGR) community, with critical expertise in biophysics, biochemistry, molecular biology, genetics, computational biology, and statistics. Trainees are supported for a period of two years as a part of their doctoral programs. Please click on the link to read the news story about this training grant! October 4th – 8th, 2018- Dr. Pugh attended the American Society for Biochemistry and Molecular Biology Conference in Snowbird, Utah to discuss Transcriptional Regulation by Chromatin and RNA Polymerase II. October 3rd and 4th, 2018- Dr. Pugh traveled to Madison, Wisconsin for the 3rd Annual Wisconsin Epigenetics Group Symposium to discuss the lab’s the research on epigenetics and gene regulation. July 22 – 26, 2018- Dr. Pugh traveled to Newry, ME to attend the Gordon Research Conference on Chromatin Structure and Function. The title of Dr. Pugh’s talk was Genomic Mechanisms of Gene Regulation and Chromatin Organization. The 2018 Gordon Conference on Chromatin Structure and Function will bring together leading experts and newcomers to the field, to present and discuss their newest research on chromatin, its complex interactions, and its regulatory power in shaping genome architecture and function. Technologies to visualize and map chromatin at all levels are proceeding at a rapid pace. The meeting will highlight how chromatin structures, ranging from the nucleosome – the “building block” of chromatin – up to the dynamic three-dimensional spatial organization of the chromosome, are assembled, maintained, and altered, and how this ultimately controls genome functions. Interconnected questions at the frontier of the field will be addressed – how does the nucleosome interact with other nuclear factors, how is chromatin assembled, disassembled, and maintained in a dynamic state, what is the molecular basis for the crosstalk between epigenetic modifications and metabolism, and how does dysfunction of any of these processes result in disease. Presentations will encompass a wide variety of innovative technical approaches – from Angstrom level description of chromatin components at all organizational levels to the visualization of micron-scale structures by light microscopy, and the mapping of chromatin states genome-wide at unprecedented resolution. There will be a focus on new methods to determine chromatin dynamics and the relationships between chromatin structure and function, and on adapting these to the level of single molecules and single cells. 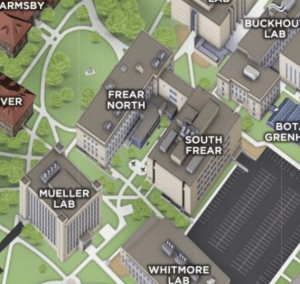 This conference has a long history of attracting the top researchers in chromatin research, and has a history of bringing in “players” from related fields. It always has been an important forum for fostering new ideas, interactions and collaborations, and this tradition will be continued in 2018. Conference attendees traditionally stay for the duration of the meeting, and the presentation of unpublished material is strongly encouraged. We will continue to integrate new members into this growing field; a large number of talks will be reserved for young scientists and for under-represented minorities, and all applicants will have the opportunity to present a poster on their work. Many platform presentation topics will be selected from submitted abstracts to ensure inclusion of the latest developments during the formal sessions. Additionally, “Poster Previews” will highlight selected posters in short oral presentations. Sufficient discussion time will be scheduled into every session to promote the lively and free exchange of ideas and interpretations and there will be ample time set aside in the afternoons and after the evening sessions for the informal interactions that have always played a key role at this conference. 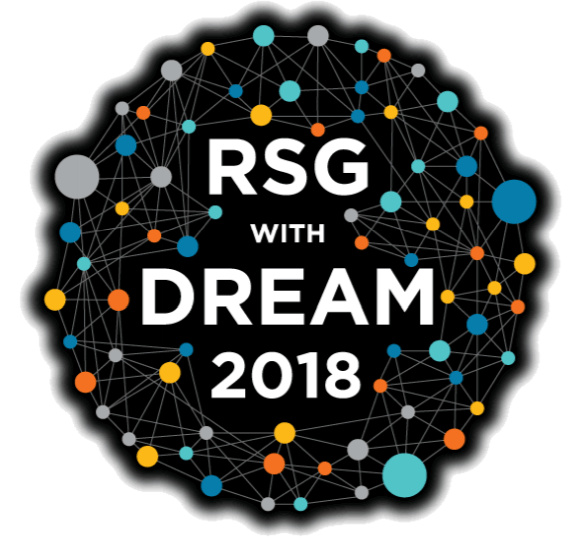 As a new feature this year, the GRC will be preceded by a GRS which we expect to further enhance interactions and networking among the younger conference participants. 2018 Pugh – Mahony Annual Lab Outing! Here at Pugh lab we care about building good community. 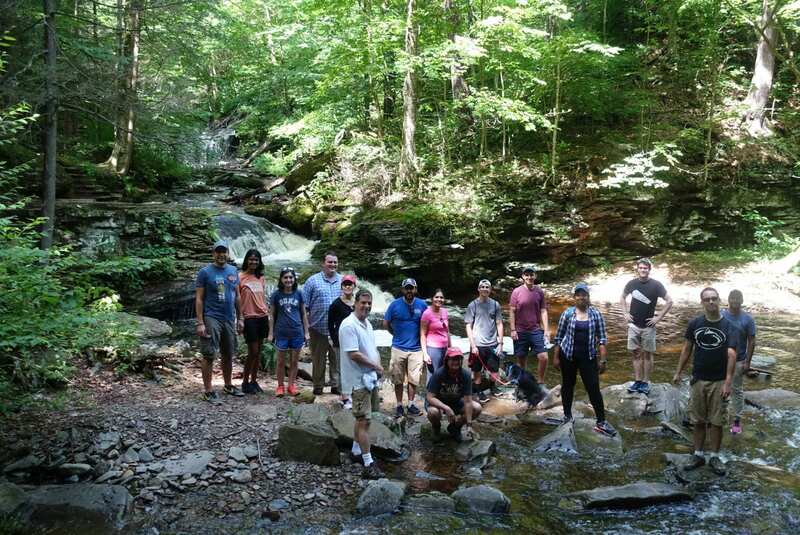 That is why each year we plan various group activities outside of the lab, such as our annual lab outing. 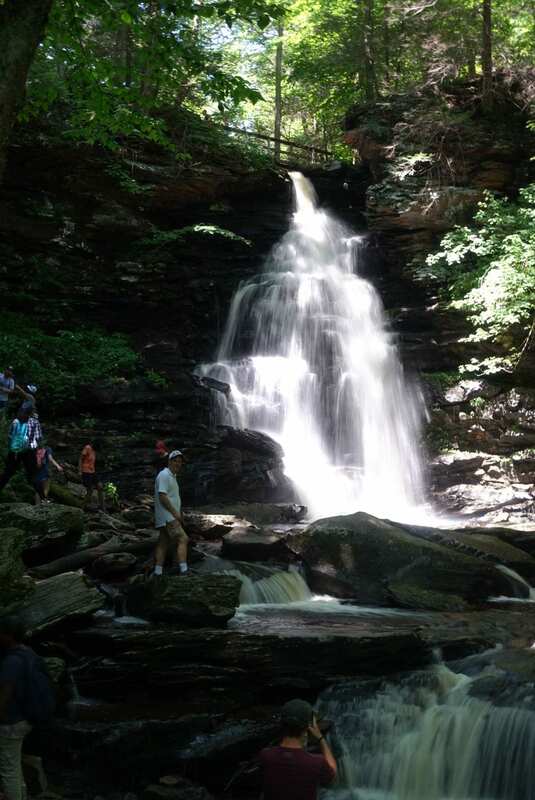 This year for our annual lab outing we camped at Ricketts Glenn, followed by an early Fourth of July barbecue. 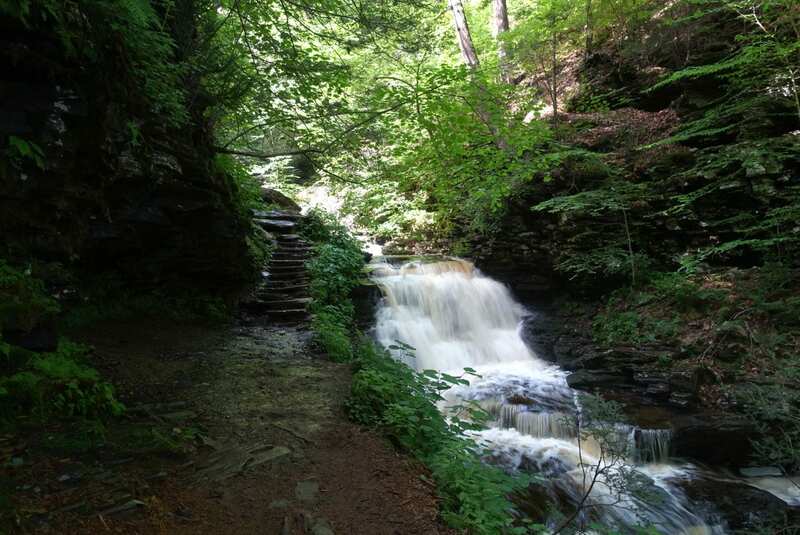 Please enjoy some picture from our outdoor adventure! 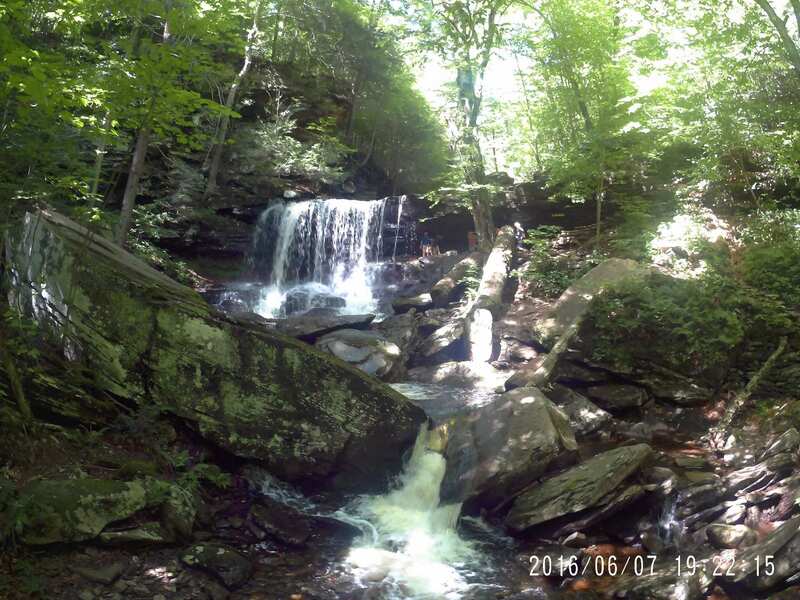 Central Pennsylvania is a beautiful place to live and work!